In the event of an emergency, are you going to be an asset or a victim? Your community has a program to train YOU to be a resource in the event of an emergency! In the San Ramon Valley there are only a limited number of emergency personnel on duty at any given time In the event of an emergency first responders are going to be focused on infrastructure and urgent needs. 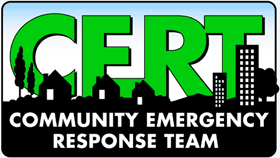 Become CERT Trained so you can be a resource to your immediate community! For the San Ramon Valley Fire District click HERE and for the CERT program click HERE. San Ramon courses start on March 14th (Wednesday nights for 6 weeks) or March 17th for two Saturdays. Subscribe to my blog for periodic emergency preparedness tips! Taking it on one step at a time will prepare you and your family in the event of an emergency. Be a resource – not a victim.